the perfect blend of fine and rustic food at reasonable prices, and this consistently for many years. Second, it is ideally located near the central station featuring an outdoor area. Third, the place is modernly styled and has a pleasant ambiance. The restaurant’s setting about 5 minutes from the central station and the Bahnhofstrasse is hard to beat. 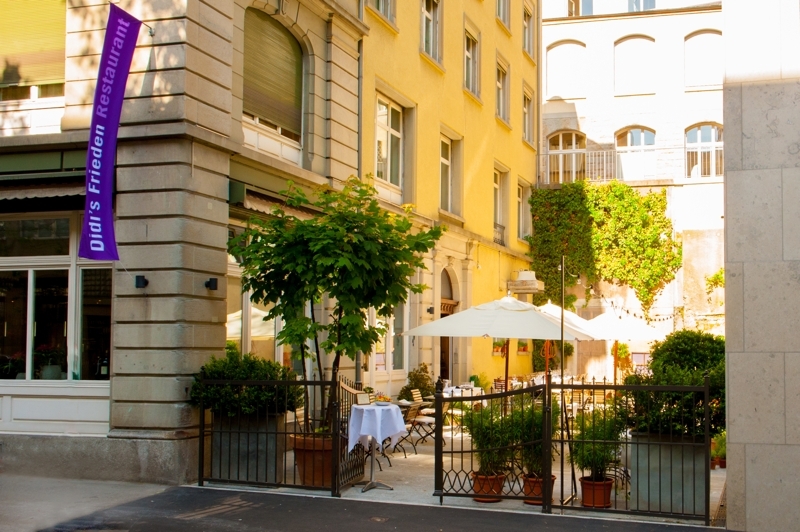 In addition, it is situated on a quiet, tree-shaded street, which is a pleasant experience when coming from the hustle and bustle of the main railway station and the shopping area around Bahnhofstrasse. The black & white dining room with wooden floor and big windows is still very stylish, although the restaurant’s opening dates back almost 20 years. It is a lively open space and almost always quite densely packed. In addition, there is a nice outdoor garden patio. The menu is always written by hand, which makes it personal. For lunch, there are 8 daily changing set menus including either a salad or soup. You get sound value for money here. The same can be said for dinner where you can choose between the set menu with 4 or 5 courses and the a la carte menu. Regarding the food concept, the cuisine is refined without being too much so. The chef, Didi, serves classics with modern influences. Every dish I have had so far was well prepared and a tasty creation. The plates are nicely arranged, but without being too artsy and the portions are reasonable. In the past, I always went to Didi’s Frieden to have dinner. Last time, I had been there for lunch for the first time. Whereas my friend left away the included salad or soup, I went for the warm zucchetti-tomato salad, although it did not suit the season and the same vegetables were part of my main. Having said that, it was well done and tasty enough. When it came to mains, my friend had deer strips with porcini on celery puree and green salad with pumpkin seed oil dressing. 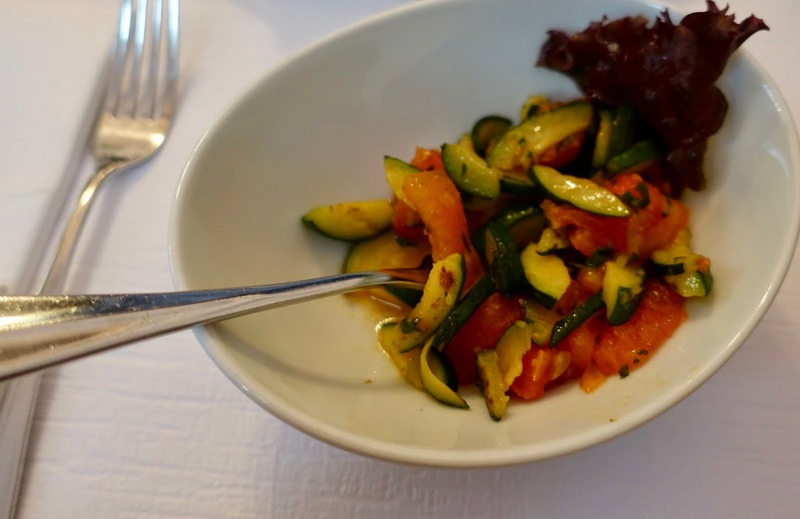 She – who is a picky eater – praised the dish highly. 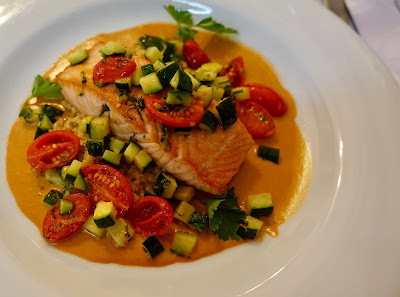 My main course was a Scottish salmon fillet with a scampi cream sauce on zucchetti, tomatoes and quinoa. The fish was cooked to perfection and had a delicate flavor. The sauce – rich and tasteful – was the ideal complement and made the rather ordinary dish special. 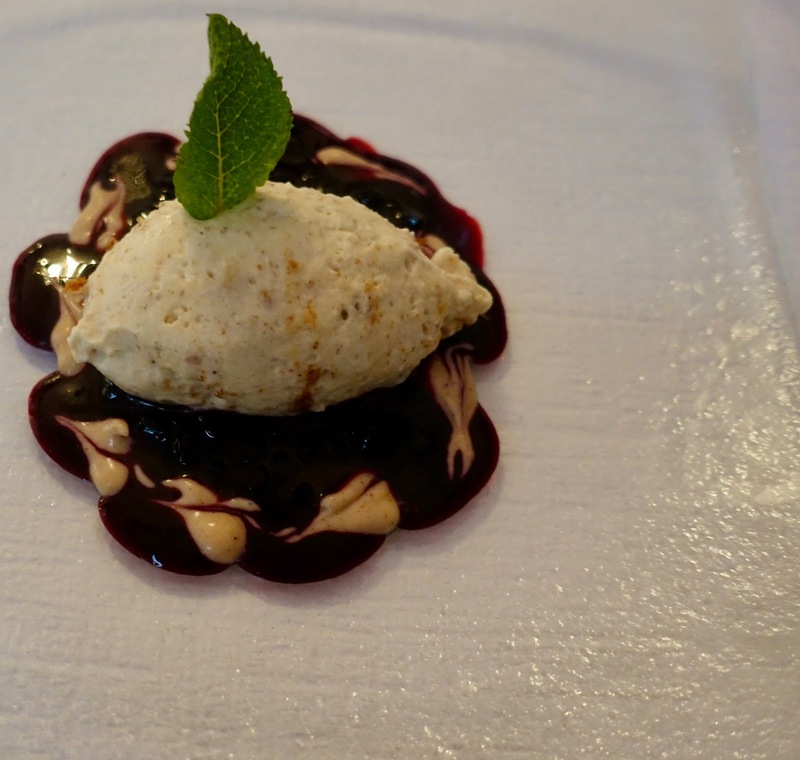 The mini dessert – for me only –, a gingerbread mousse on elderberry compote, was tenderly melting and blended magnificently. It was a great finish of a good, albeit not the best meal I have ever had here. 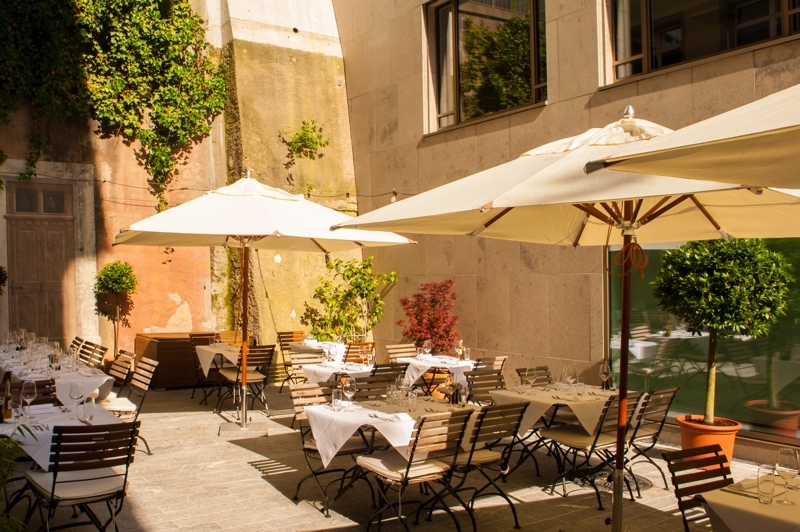 But lunchtime at Didi’s Frieden is not the same as dinner, which is more upscale. Didi’s Frieden is a likable place, it conveys a certain relaxed attitude that never fails to have a calming effect on me. Maybe this is also because of the restaurant’s name “Frieden”, which means “peace”, I do not know. As the eatery is very popular, it is rather packed at most times. This goes along with quite a vibrant atmosphere. The staff suites the place. It is kind and efficient yet easy-going. In any case, it is everything but formal. Didi’s Frieden is not the place where you have to wait endlessly long to be served. The service is paced exactly right at dinner. 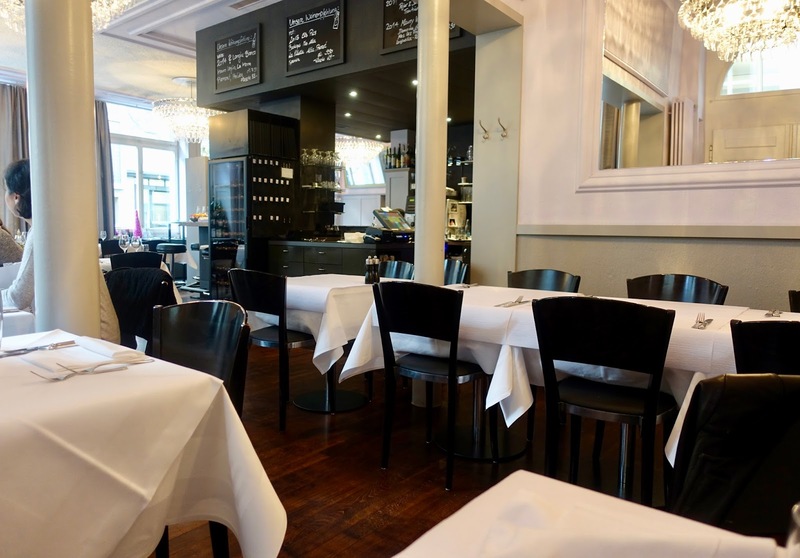 At lunch – with a clientele consisting mainly of business people –, it is very quick. You cannot go wrong with Didi’s Frieden when having a excellent meal in mind featuring classics, newly interpreted. The favorably located restaurant with its casual elegance and the friendly yet uncomplicated staff is a long-standing fave of mine in Zurich. Make reservations well in advance because it is very popular and almost always rather packed.